Predictors of Incomplete Occlusion following Pipeline Embolization of Intracranial Aneurysms: Is It Less Effective in Older Patients? aFrom the Neurosurgical Service (N.A., J.M.M., M.W., C.J.G., R.G., A.A.D., R.M.-L., A.A., A.J.T., C.S.O. ), Beth Israel Deaconess Medical Center, Harvard Medical School, Boston, MassachusettsdDepartment of Neurosurgery (N.A. ), Louisiana State University, Shreveport, Louisiana. BACKGROUND AND PURPOSE: Flow diversion with the Pipeline Embolization Device (PED) for the treatment of intracranial aneurysms is associated with a high rate of aneurysm occlusion. However, clinical and radiographic predictors of incomplete aneurysm occlusion are poorly defined. In this study, predictors of incomplete occlusion at last angiographic follow-up after PED treatment were assessed. MATERIALS AND METHODS: A retrospective analysis of consecutive aneurysms treated with the PED between 2009 and 2016, at 3 academic institutions in the United States, was performed. Cases with angiographic follow-up were selected to evaluate factors predictive of incomplete aneurysm occlusion at last follow-up. RESULTS: We identified 465 aneurysms treated with the PED; 380 (81.7%) aneurysms (329 procedures; median age, 58 years; female/male ratio, 4.8:1) had angiographic follow-up, and were included. Complete occlusion (100%) was achieved in 78.2% of aneurysms. Near-complete (90%–99%) and partial (<90%) occlusion were collectively achieved in 21.8% of aneurysms and defined as incomplete occlusion. Of aneurysms followed for at least 12 months (211 of 380), complete occlusion was achieved in 83.9%. Older age (older than 70 years), nonsmoking status, aneurysm location within the posterior communicating artery or posterior circulation, greater aneurysm maximal diameter (≥21 mm), and shorter follow-up time (<12 months) were significantly associated with incomplete aneurysm occlusion at last angiographic follow-up on univariable analysis. However, on multivariable logistic regression, only age, smoking status, and duration of follow-up were independently associated with occlusion status. CONCLUSIONS: Complete occlusion following PED treatment of intracranial aneurysms can be influenced by several factors related to the patient, aneurysm, and treatment. Of these factors, older age (older than 70 years) and nonsmoking status were independent predictors of incomplete occlusion. While the physiologic explanation for these findings remains unknown, identification of factors predictive of incomplete aneurysm occlusion following PED placement can assist in patient selection and counseling and might provide insight into the biologic factors affecting endothelialization. The flow-diverting Pipeline Embolization Device (PED; Covidien, Irvine, California) has become a mainstay for the treatment of intracranial aneurysms.1 The device was approved by the US Food and Drug Administration in 2011 for the treatment of large or giant, wide-neck brain aneurysms along the internal carotid artery in adults.2 Numerous studies have since demonstrated the safety and efficacy of the PED in treating aneurysms with varying morphologies in different anatomic locations.3⇓⇓⇓⇓–8 As the clinical indications for PED placement expand, predictors of radiographic outcomes have become a topic of ongoing investigation. Although 1 study found that fusiform aneurysm morphology and shorter follow-up length were independent predictors of incomplete occlusion, this study was limited by a small sample size and a mean follow-up of 6.1 months.9 The expanding use of PEDs for treating intracranial aneurysms necessitates an evaluation of predictors of incomplete occlusion. A retrospective analysis of consecutive aneurysms treated with PED placement between 2009 and 2016 at 3 academic institutions (Beth Israel Deaconess Medical Center; Department of Neurosurgery, University of Alabama at Birmingham; and State University of New York at Buffalo) in United States was performed. Inclusion criteria consisted of all adult patients with intracranial aneurysms treated with the PED who had undergone angiographic follow-up. Both ruptured and unruptured aneurysms were included; all aneurysm morphologies (ie, saccular, blister, fusiform, dissecting) and intracranial locations were included. Institutional review board approval was obtained at all 3 centers before the commencement of the study. We collected the following information: patient demographics, aneurysm and PED characteristics, procedural complications, and angiographic and functional outcomes. Patients received aspirin, 325 mg, and clopidogrel, 75 mg daily, for 3–14 days before the intervention. Platelet function testing was routinely performed with a whole-blood Lumi-Aggregometer (Chrono-Log, Havertown, Pennsylvania), light transmission aggregometry, or the VerifyNow P2Y12 assay (Accumetrics, San Diego, California). Clopidogrel nonresponders were identified on the basis of established cutoff values at the individual institutions, and manufacturers' recommendations were used for guidance. If a patient was identified as a clopidogrel responder, the clopidogrel was continued. If a patient was identified as a clopidogrel nonresponder, the choice to continue the same dose of clopidogrel, administer a 1-time 600-mg clopidogrel boost within the 24 hours before the procedure, or switch to ticagrelor was at the discretion of the interventionalist performing the procedure. Patients undergoing treatment of a ruptured aneurysm received a loading dose of aspirin, 650 mg, and clopidogrel, 600 mg, before the intervention. Patients underwent local anesthesia with sedation or general anesthesia at the discretion of the individual institutions, and all patients were anticoagulated with heparin throughout the procedure. The type of guide catheter and microcatheter used for PED deployment was at the discretion of the individual institutions. The deployment and apposition of the PED to the ICA wall was documented by fluoroscopy. Dual-antiplatelet therapy was continued for at least 3 months after the procedure, and aspirin was continued indefinitely thereafter. Angiographic outcome was assessed with digital subtracted angiography or MR angiography10,11 on the basis of the follow-up protocols at the discretion of each individual institution. In 1 institution, patients were imaged and reviewed at 6 months postprocedure with DSA, then at 2 and 5 years with DSA or MRA. In the second institution, patients were reviewed at 6 and 12 months postprocedure with MRA, then annually until 5 years with MRA. In the third institution, patients were followed at 3 and 6 months postprocedure with MRA, at 12 months with DSA, and then annually until 5 years with MRA. Aneurysm occlusion on follow-up DSA was assessed by the treating interventionalist. Follow-up MRAs were assessed by a radiologist blinded to the clinical history and an interventionalist. Occlusion was categorized as complete occlusion (100%), near-complete occlusion (90%–100%), and partial occlusion (<90%). Both near-complete and partial occlusion were collectively defined as incomplete occlusion. Functional outcome was assessed with the modified Rankin Scale at last follow-up by the interventionalist at each institution. Statistical analysis was performed with SPSS 21.0 (IBM, Armonk, New York). In univariable analysis, variables were compared among groups with the nonparametric test for continuous variables and the χ2 test for categoric variables, to identify predictors of incomplete occlusion. Statistical significance was defined as P < .05. Multivariable logistic regression was performed on candidate predictor variables to identify variables independently associated with incomplete occlusion at last angiographic follow-up after controlling for potential confounders. A total of 465 aneurysms treated with PED placement at the 3 institutions were identified. Of these, 380 (81.7%) aneurysms treated by 329 PED procedures (median age, 58 years; female/male ratio, 4.8:1) had angiographic follow-up and were included in this study. Current smoking and multiple aneurysms were present in 25.8% and 45% of procedures, respectively. The pretreatment mRS was 0–2 in 95.4% of procedures and 3–5 in 4.6%. Treatment in the setting of immediate aneurysmal subarachnoid hemorrhage occurred in 3% of procedures. Aneurysms were mostly located along the ICA (83.2%), followed by the posterior circulation (13.4%). Most aneurysms were saccular (67.6%) or fusiform (26.9%). The median maximal diameter and neck size were 7.7 and 4 mm, respectively. A daughter sac was present in 24.7% of aneurysms (Table 1). A single PED was used in the treatment of 77.5% of procedures, while ≥2 PEDs were placed in 22.5%. The median length of angiographic follow-up was 13.5 months (mean, 19.2 months). At last follow-up, complete occlusion (100%) was achieved in 78.2% of aneurysms, while near-complete occlusion (90%–99%) was achieved in 7.6%, and partial occlusion (< 90%), in 14.2%. Of aneurysms followed for at least 12 months (211 of 380), complete occlusion was achieved in 83.9%. Retreatment was performed in 6.3% of aneurysms and was exclusively endovascular. At last follow-up, the mRS scores improved in 33.4% and worsened in 8.8%; this percentage included patients presenting with aneurysmal SAH. Symptomatic thromboembolic complications were encountered in 5.2% of procedures, and symptomatic hemorrhagic complications, in 1.8%. The mortality rate was 1.2% (4 cases); this was due to either ischemic stroke (2 cases), early postprocedure hemorrhage (1 case), or pretreatment aneurysmal SAH (1 case) (Table 2). On univariable analysis, older age (older than 70 years, P = .002), nonsmoking status (P = .005), aneurysm location within the posterior communicating artery or posterior circulation (P = .01), larger aneurysm maximal diameter (≥21 mm, P = .03), and shorter follow-up time (<12 months, P = .001) were associated with significantly higher rates of incomplete occlusion at last follow-up (On-line Table). Significant predictors of incomplete occlusion at last follow-up in univariable analysis were further analyzed in multivariable logistic regression. Older age (older than 70 years; OR, 2; 95% CI, 1.1–3.8; P = .03; Figure), nonsmoking status (OR, 2; 95% CI, 1.1–3.9, P = .03), and shorter follow-up time (<12 months; OR, 2; 95% CI, 1.2–3.5; P = .007) were independently associated with a higher rate of incomplete occlusion at last follow-up (Table 3). Age-related variation in the rate of complete occlusion following intracranial aneurysm treatment with PEDs. In this study, we report a multicenter experience with PED placement for the treatment of intracranial aneurysms, with a focus on identifying predictors of incomplete occlusion at last angiographic follow-up. Complete occlusion was achieved in 79.7% of cases. Although several patient- and aneurysm-related factors were significantly associated with a higher rate of incomplete aneurysm occlusion on univariable analysis, only age, smoking status, and length of follow-up were independently associated with occlusion status. In this study, we found that older age (older than 70 years) was a significant predictor of incomplete occlusion at last follow-up. This is the first study to specifically evaluate age and its impact on aneurysm occlusion rates following flow diversion, to our knowledge. There was a tendency for aneurysms to be located within the posterior circulation in this age group compared with younger patients (25% versus 10.9%, P = .001), which may influence this finding. Nevertheless, the difference in occlusion rates remained significant after controlling for aneurysm location, which further supported the independent correlation between older age (older than 70 years) and incomplete occlusion. There was no significant difference in the duration of follow-up in older patients compared with younger patients. As one might expect, as patients age, the risk of complications appears to increase. 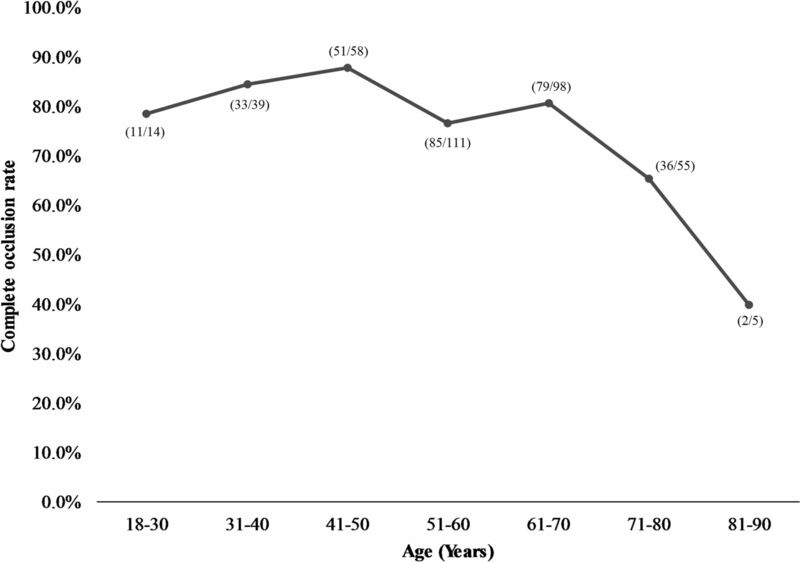 Brinjikji et al,20 in a large multicenter study on complications associated with PED placement, found that complication rates rise as the patient age increases. Patients older than 70 years of age had significantly higher rates of neurologic mortality. Increased age was also associated with higher odds of neurologic morbidity.20 Our data found a nonsignificant trend toward increased complications in patients older than 70 years of age. While the explanation for the lower occlusion rates in the elderly is currently unknown, it is tempting to speculate that this may be due to a deficiency in the endothelial repair pathway. Rouchaud et al21 found that the genes involved in cellular migration and the inflammatory response were upregulated in aneurysms successfully treated with flow diverters in rabbits. Other studies have identified an upregulation of metalloproteinases (critical for endothelial wall remodeling), inflammatory modulators, and growth factors.22 In animal models, complete or near-complete endothelialization, which can occur as rapidly as within the first 7 days, is necessary to ensure complete obliteration of the aneurysm.23 In a histologic study of giant aneurysms that had undergone flow-diversion treatment and had failed to occlude, lack of endothelialization was predominantly found in patients in their 60s.24 It may be that the endothelial cells in the cerebral vasculature have a diminished capacity for regeneration and migration across the flow-diverter surface, similar to the reduction in neural stem cell proliferation and differentiation potential in the aging brain.25,26 While this hypothesis requires further investigation, it raises the tantalizing possibility of coating flow diverters with factors that may enhance endothelialization and may be absent in the cellular milieu of the elderly. Smoking is one of the significant modifiable risk factors for aneurysm formation and increased risk of aneurysm rupture.28⇓–30 Ortiz et al31 have previously reported a correlation between current smoking status and an increased risk of aneurysm recurrence. However, in that study, the authors stratified smoking status into never/nonsmokers and former/current smokers, despite smoking secession decreasing the risk of vascular inflammation and related malformations.32 Therefore, with appropriate stratification of current smoking as a separate category, there was no significant effect on aneurysm recurrence or retreatment after endovascular treatment.12,29 Similarly, Rouchaud et al33 found no significant correlation between smoking status and aneurysm occlusion following PED placement. In our study, smoking was associated with a higher rate of aneurysm occlusion. Although this finding can be attributed to the relatively small sample size, it might also be related to an increased rate of intra-aneurysmal thrombosis. Smoking is a well-known risk factor for thrombus formation in other pathologies, including cancer, cardiac stent thrombosis, and ischemic stroke. It may be that its prothrombotic effects amplify those of the PED.34⇓–36 These findings support an earlier statement by Rouchaud et al33 that smoking status should not be a factor for excluding patients from PED embolization of intracranial aneurysms. We acknowledge that our study is limited by its retrospective nature with all the inherent biases associated with such a study design. Although the inclusion of multiple institutions improves the generalizability of the findings, it introduces variability in patient management, follow-up protocols, imaging studies used, and evaluation of aneurysm occlusion. Moreover, some aneurysm measurements were missing. Complete occlusion following PED treatment of intracranial aneurysms is influenced by patient characteristics and technical factors. Older age (older than 70 years) and nonsmoking status were independent predictors of incomplete occlusion. While the physiologic explanation for these findings remains unknown, the identification of factors predictive of incomplete aneurysm occlusion following PED placement can help in directing further research on the appropriate clinical use of flow-diversion devices. Nimer Adeeb and Justin M. Moore contributed equally to this work. Disclosures: Adnan H. Siddiqui—UNRELATED: Board Membership: Intersocietal Accreditation Commission; Consultancy: Codman, Medtronic, Guidepoint Global Consulting, Penumbra, Stryker Neurovascular, MicroVention, W.L. Gore and Associates, Three Rivers Medical, Corindus, Amnis Therapeutics, CereVasc, Pulsar Vascular, The Stroke Project, Cerebrotech Medical Systems, Rapid Medical, Neuravi, Silk Road Medical, Rebound Therapeutics Corp, Claret Medical, Comments: also Principal Investigator/National Steering Committees: Penumbra: 3D Separator Trial, COMPASS Trial, INVEST Trial; Covidien (now Medtronic): SWIFT PRIME and SWIFT DIRECT Trials; MicroVention: FRED Trial, CONFIDENCE Study; Codman & Shurtleff: LARGE Trial; MUSC: POSITIVE Trial; Stock/Stock Options: StimMed, Valor Medical, Neuro Technology Investors, Cardinal Health, Medina Medical Systems, Buffalo Technology Partners, International Medical Distribution Partners. Elad I. Levy—UNRELATED: Board Membership: Stryker Neurovascular, NeXtGen Biologics, MEDX, Comments: served on acute ischemic stroke Clinical Advisory Board for Stryker Neurovascular, serve on Advisory Board for NeXtGen Biologics and MEDX; no money; Consultancy: Pulsar Vascular; Payment for Development of Educational Presentations: Covidien, Comments: honorarium for training and lectures; Stock/Stock Options: Intratech Medical, NeXtGEn Biologics, Comments: shareholder/ownership interest; Other: Abbott Vascular, Comments: carotid training sessions for physicians. Ajith J. Thomas—UNRELATED: Consultancy: Stryker Neurovascular, Comments: data safety monitoring board*; Expert Testimony: CRICO, Comments: expert witness, neurovascular. *Money paid to the institution. Health C for D and R: Recently-Approved Devices: PipelineTM Embolization Device, P100018. https://www.fda.gov/downloads/AdvisoryCommittees/CommitteesMeetingMaterials/MedicalDevices/MedicalDevicesAdvisoryCommittee/NeurologicalDevicesPanel/UCM442242.pdf. Accessed August 9, 2016. Accepted after revision July 8, 2017. You are going to email the following Predictors of Incomplete Occlusion following Pipeline Embolization of Intracranial Aneurysms: Is It Less Effective in Older Patients?